Today’s Dietitian mines the latest science to provide strategies to help clients power up on bone-friendly foods and nutrients. If you’ve worked in healthcare long enough, you know the importance of bone health. As people develop osteoporosis—a disease that occurs in those who lose too much bone, make too little, or both—bones become weak and can break, even with a minor fall, bump, or sneeze. Unfortunately, osteoporosis isn’t rare; about 10 million Americans have it, and another 34 million are at risk. Both women and men are at risk of developing the condition as they age, but women are particularly vulnerable, as eight in 10 sufferers are female.2 Additionally, about one-half of women and up to one-quarter of men older than 50 will break a bone because of osteoporosis. Also, it’s called a “silent” condition because many people don’t know they have bone disease until they suffer a fracture. 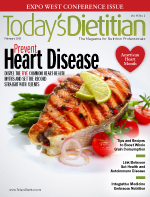 A growing field of science shows that diet can be an important tool in preventing bone disease. Bone health is the result of bone mass, bone architecture, and body mechanics—all of which are supported by nutrition throughout the human life cycle. The following nutrients and the foods that contain them hold particular promise in promoting optimal bone health. Calcium is a mineral essential for both building bones and keeping them healthy. The body uses bone tissue as a reservoir and source of calcium to maintain constant concentrations of calcium in the blood, muscles, and intercellular fluids. Bone is in a continuous state of “remodeling” under the control of osteoblasts (cells that form bones) and osteoclasts (cells that help eat away old bone). Constant resorption (breaking down and releasing minerals) and deposition of calcium into new bone occurs, and the balance changes with age. Bone formation exceeds resorption in periods of growth, such as in childhood, but is relatively equal during early and middle adulthood and in aging adults. Breakdown exceeds formation particularly among postmenopausal women. “We know from multiple research studies that calcium is essential for bone, but the majority of Americans aren’t getting enough. Eight-five percent of girls across the country aged 9 to 13, a time of maximal bone growth with 40% of adult bone mass made during that time period, aren’t hitting their daily calcium target,” Schneider says. How can you help your patients meet their calcium goals? “I recommend the usual suspects: milk and enriched milk alternatives, such as soy and almond milk, cheese, and yogurt. I also recommend the lesser known calcium-rich foods, such as bok choy, kale, turnip greens, almonds, white beans, tofu, and fortified orange juice,” says Kathryn Ciamaichelo, RD, lead outpatient dietitian and wellness coordinator for Sodexo Nutrition Services at Memorial Hospital in Colorado Springs. Vitamin D also is essential to bone health, as it promotes calcium absorption in the gut, maintains adequate serum calcium and phosphate concentrations for normal mineralization of bone, and supports the process of bone remodeling by osteoblasts and osteoclasts. Vitamin D deficiency can cause rickets, a disease in children characterized by soft, deformed bones. The Dietary Guidelines lists vitamin D as a nutrient of concern, noting that most dietary intakes are below recommendations. “The advice is to try and get as much vitamin D as possible from the diet, but in many cases a supplement may be needed,” says Jeri Wanzor Nieves, PhD, an associate professor of clinical epidemiology at Columbia University and the nutrition principal investigator for the New York State Osteoporosis Prevention Education Program. “It’s also important to point out to clients that the Percent Daily Value on nutrition facts labels is set at only 400 IU, so people may be miscalculating how much vitamin D they’re getting from foods. In addition, there may be multiple factors preventing adequate vitamin D intake through sun exposure. It depends on where you live, how much casual exposure you have to sunlight, age, time of year, and body size. For the overweight or obese, it’s going to take more vitamin D to fill up the tank, and [it depends on] whether they have darker skin, which requires more vitamin D,” Schneider says. Vitamin K insufficiency is linked with low bone mineral density and increased fractures, while vitamin K supplementation has been shown to improve the bone turnover profile.15 More research is needed to understand the role of these nutrients in osteoporosis prevention. Eating a diet rich in fruits and vegetables may protect bones through several mechanisms, including creating an alkaline environment that reduces the acidity in the body and providing more bioactive components, such as phenols and flavonoids, that act as antioxidants. Some specific fruits and vegetables have been linked to bone health, including lycopene-rich produce such as watermelon, tomatoes, pink grapefruit, bell peppers, and guava. A 2009 study found that carotenoids, particularly lycopene, help protect older women’s lumbar spine and older men’s hips against fracture.17 And one study found that postmenopausal women who enjoyed two daily drinks—either wine or beer—had 5% to 8.3% greater hip and spine bone density than nondrinkers.18 However, heavy drinking (more than two drinks per day) appears to weaken bones and increase the risk of falls. According to Nieves, the current body of evidence suggests that many nutrients may be beneficial for bone health and if individuals can increase their consumption of nutrient-rich foods, they will be able to meet their needs. “Many years of research have shown that it’s much better to get these nutrients from food for overall health,” she adds. “It’s hard to tease out individual nutrients from the diet. People with a healthier diet, with a good source of protein, fruits, and vegetables have healthier lifestyles. By eating a balanced, healthful diet, you’re getting micronutrients in the diet,” Schneider says. This healthful eating pattern also applies to a moderate intake of other foods. For example, high levels of protein, caffeine, sodas, and sodium have been linked to calcium loss. “Many Americans consume too much protein, which can increase the urinary excretion of calcium, and this is of particular concern in a person with calcium intakes that are low,” Nieves says. “However, at older ages, protein intake is often too low, and this may lead to bone loss and fractures. In addition, there are reports that protein supplementation may help the healing of hip fractures,” she adds. Maintaining a healthful weight through diet and physical activity are key strategies for preventing bone disease. “Osteoblasts come from stem cells. If you have physical activity and mechanical stress, stem cells make osteoblasts. If there’s inactivity, stem cells become adipocytes—fat cells. And we now know that fat isn’t inert; it has a lot of inflammatory factors that aren’t good for bone,” Schneider says. “Physical activity is key to bone health, and the suggestion is to combine a program of weight-bearing activity, simply to carry the weight of your skeleton, such as walking; strength training to improve the muscles that support your skeleton; and exercises to improve your balance to prevent falls,” Nieves says. When it comes to preserving bones, there’s a lot at stake, and dietitians have the skills to help their clients. — Sharon Palmer, RD, is a contributing editor at Today’s Dietitian, a freelance food and nutrition writer in southern California, and the author of The Plant-Powered Diet. 1. Bone Health and Osteoporosis: A Report of the Surgeon General. Rockville, MD: US Department of Health and Human Services Office of the Surgeon General; 2004. 2. Learn about osteoporosis. National Osteoporosis Foundation website. http://www.nof.org/learn. Accessed October 15, 2012. 3. US Department of Agriculture, US Department of Health and Human Services. Dietary Guidelines for Americans, 2010. 7th ed. Washington, DC: US Government Printing Office; 2010. 4. NBHA reacts to media coverage regarding the US Preventive Services task force vitamin D and calcium supplementation to prevent cancer and osteoporotic fractures in adults draft recommendation statement. National Bone Health Alliance website. June 14, 2012. Accessed October 15, 2012. 5. Dietary supplement fact sheet: calcium. Office of Dietary Supplements website. http://ods.od.nih.gov/factsheets/Calcium-HealthProfessional. Accessed October 16, 2012. 6. Dietary reference intakes (DRIs): recommended dietary allowances and adequate intakes, vitamins. Institute of Medicine website. http://iom.edu/Activities/Nutrition/SummaryDRIs/~/media/Files/Activity Files/Nutrition/DRIs/RDA and AIs_Vitamin and Elements.pdf. Accessed October 16, 2012. 7. How much food from the dairy group is needed daily? ChooseMyPlate website. http://www.choosemyplate.gov/food-groups/dairy-amount.html. Accessed October 20, 2012. 8. Dietary supplement fact sheet: vitamin D. Office of Dietary Supplements website. http://ods.od.nih.gov/factsheets/VitaminD-HealthProfessional/. Accessed on October 18, 2012. 9. Anderson JJ, Roggenkamp KJ, Suchindran CM. Calcium intakes and femoral and lumbar bone density of elderly US men and women: National Health and Nutrition Examination Survey 2005-2006 analysis. J Clin Endocrinol Metab. 2012;97(12):4531-4539. 10. Giovannucci E, Rimm EB, Wolk A, et al. Calcium and fructose intake in relation to risk of prostate cancer. Cancer Res. 1998;58(3):442-447. 11. Vitamin D and calcium supplementation to prevent cancer and osteoporotic fractures. US Preventive Services Task Force website. http://www.uspreventiveservicestaskforce.org/uspstf12/vitamind/vitdfact.pdf. Accessed October 19, 2012. 12. Healthy eating plate. Harvard School of Public Health website. http://www.hsph.harvard.edu/nutritionsource/healthy-eating-plate. Accessed October 18, 2012. 13. Zhu LL, Cao J, Sun M, et al. Vitamin C prevents hypogonadal bone loss. PLoS ONE. 2012;7(10):e47058. 14. Dietary supplement fact sheet: magnesium. Office of Dietary Supplements website. http://ods.od.nih.gov/factsheets/Magnesium-HealthProfessional. Accessed October 20, 2012. 15. Bügel S. Vitamin K and bone health in adult humans. Vitam Horm. 2008;78:393-416. 16. Fernández-Real JM, Bulló M, Moreno-Navarrete JM, et al. A Mediterranean Diet enriched with olive oil is associated with higher serum total osteocalcin levels in elderly men at high cardiovascular risk. J Clin Endocrinol Metab. 2012;97(10):3792-3798. 17. Weaver CM, Alekel DL, Ward WE, Ronis MJ. Flavonoid intake and bone health. J Nutr Gerontol Geriatr. 2012;31(3):239-253. 18. Tucker KL, Jugdaohsingh R, Powell JJ, et al. Effects of beer, wine, and liquor intakes on bone mineral density in older men and women. Am J Clin Nutr. 2009;89(4):1188-1196.